Apart from a very spin on a friend’s Orbea Orca a few back, I’ve had no experience of riding carbon bikes, and I had an old-school view that “carbon wasn’t necessarily better than modern steel, aluminium or titanium”, but a spin on a Planet X carbon bike has changed that. 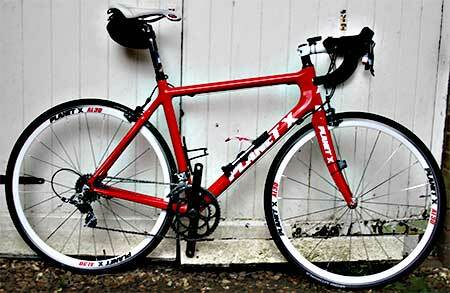 Paul’s bike is a couple of years old and is decked in a mixture of Sram Red and Force components, aluminium wheels and a snazzy red paint job. It’s a Large frame, and that was the reason for the spin, as Planet-X have just released an almost identical frame with an 11-speed Ultegra build for a smidge under a grand – and my head is screaming that it’s an option that’s too good to ignore. Hence on Sunday, as the rain started, I got my first proper ride on a carbon bike. Without wanting to jump on any stereotypes, bearing in mind my absolute skepticism about carbon as the “way to go”, it was obviously an easy bike to pedal and my first stretch from Malmesbury out to Norton was dispensed in no time. That ease of pedalling was obvious from the way I used the gearing. the PX has a compact chainset and on the Cannondale there are a couple of points where I drop onto the granny ring to rest my legs. But, I never resorted to the smaller ring on the PX and hit the top of every incline with less effort – it could be that the generally easier pedalling was keeping my legs a bit fresher, but it did feel that the weight and stiffness of the frame was more conducive to transferring all of the power to climbing hills. I didn’t get a chance to try any decent hills, such as Minchinhampton Common, but I’m hopeful that they’d be less of a grind than on the Cannondale. I didn’t weigh the PX, but I’d say that it hasn’t got the featherlight feel of say a Giant TCR Advanced or a high-specced Lynskey titanium build, but equally didn’t feel ‘weighty’. It’s worth noting that this bike was shod with aluminium wheels, and some ‘racier’ rims (such as Shimano RS80’s or Fulcrum Racing 3’s) would make improve those impressions of weight. When I picked up the bike, Paul commented that he thought the frame could be stiffer and had swapped the original seatpost for a carbon version, but I thought that the frame did a great job of transferring my pedalling to forward motion. On those stretches and small climbs where I could get out the saddle and ‘push’ the bike for more speed, the bike inspired confidence and held it’s line. There was certainly a pleasant ‘skittiness’ about the ride as the speed increased, but it never felt out of control. It’s worth a quick comment of the functioning of the Sram controls – the way that the same inward movement of the lever controls an up or down change depending on how far it is pushed was very intuitive, and was so easy that it made the ride easier… It’ll be interesting to see how Ultegra-11 compares. What that ride on Sunday means to me is that carbon is now a sensible option… It will never be a dream bike, but it might just be the perfect bike (for me and everything else that life is throwing at me at the moment)… And that dream bike might have to wait another ten years. Note, my current bike is an aluminium Cannondale R700, it’s a CAAD frame that’s been upgraded with a compact chainset and Shimano RS30 wheels. Previous PostPlanet X Pro Carbon – is it a dream bike? Next PostDEDOMP – Double expresso, dash of milk, please.